ST micro is organizing free seminars in North America, about their STM32 F0 (ARM Cortex M0) microcontrollers. 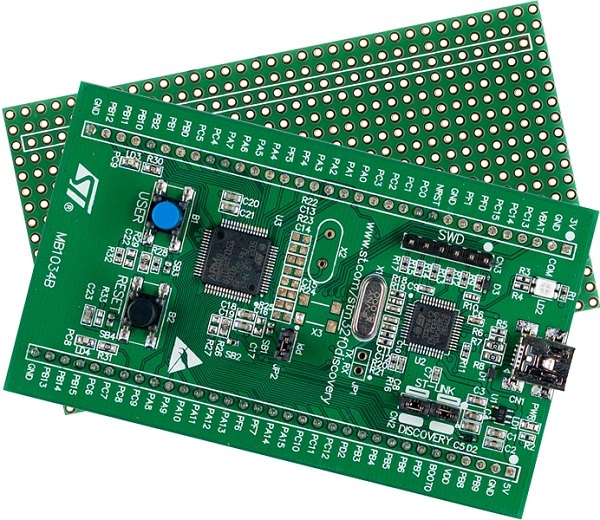 All attendees will receive a free STM32 F0 Discovery Kit. Check out the seminar schedule below. Via the forum. Thanks Bearmos! This entry was posted on Thursday, April 12th, 2012 at 8:00 pm	and is filed under dev boards, talks. You can follow any responses to this entry through the RSS 2.0 feed. You can skip to the end and leave a response. Pinging is currently not allowed. That is excellent information, I will have to continue trying to register for the Orlando seminar… that could be super cool! Start a company for about $10, just register a domain name and get Google Apps to handle your email. They’ll probably give you free lunch – and a crippled IDE too! here’s a link on how to setup a free toolchain from the site Chuckt provided: http://andybrown.me.uk/ws/2012/03/31/stm32f4discovery/ I’m sure there are many others out there (DP may have even covered one in the past – not sure). Bearmos, there is a different toolchain on the site for older MCUs.